We go back to the DS9 well for this week. Let’s look at the episode that introduced Section 31 to the ST canon, “Inquisition”, episode 6x18, that first aired April 8th, 1998. 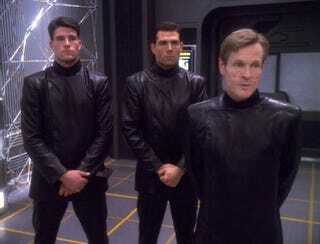 This episode introduces Section 31 and the character of Luther Sloan. The idea for Section 31 was Ira’s. He wanted to look deeper into the idea of a Federation utopia, to see what darkness hides bendeath the surface. This didn’t come out of nowhere. Memory Alpha describes how the idea developed across several episodes. The episode focused on the accusation that Bashir was a spy and there were a lot of callbacks to previous episodes. “Hippocratic Oath” - where Bashir attempted to help a group of rogue Jem’Hadar beat their addiction to Ketracel-white. “In Purgatory’s Shadow” - where it is discovered that Bashir had been replaced by a Changeling some time prior. “By Inferno’s Light” - Sloan suggests that the fact that Worf’s runabout was left orbiting Internment Camp 371 meant that the Dominion perhaps allowed Bashir to escape. “Statistical Probabilities” - where Bashir worked with a group of genetically enhanced savants and temporarily became convinced that the Federation could save billions of lives if it were to surrender to the Dominion. Because the entire episode takes place in a holographic simulation, this meant that there could be no B story. At the end of the episode Bashir compares Section 31 to the Romulan’s Tal Shiar and the Cardassian’s Obsidian Order. He is not happy with the idea of humanity having that in common with their foes. “But what would that say about us? That we’re no different than our enemies? That when push comes to shove, we’re willing to throw away our principles in order to survive?”. Sisko can only say “I wish I had an answer for you.”. In the next episode, we learn how Sisko would answer that question. Inquistion is one of the best episodes of DS9's run. It challanges the idea of a utopian Earth and dirties up Gene’s idealistic view of the future with a more realistic outlook. I hope you all enjoyed learning about this episode, and I will see you all next time for another Midweek Trivia.